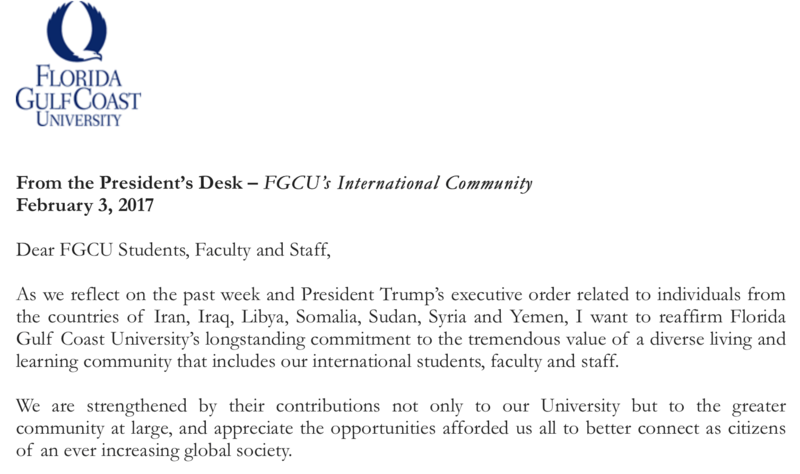 In an email sent to FGCU students, faculty and staff on Friday, Feb. 3, President Wilson Bradshaw broke the university’s weeklong silence following President Donald Trump’s executive order and travel ban. Other postsecondary institutions across the nation, namely UF and FSU in-state, responded almost immediately to the ban, which FSU President John Thrasher called “deeply concerning” within two days of the order being signed. “I want to reaffirm Florida Gulf Coast University’s longstanding commitment to the tremendous value of a diverse living and learning community that includes our international students, faculty and staff,” Bradshaw wrote. The ban affects individuals from several countries, including Iran, Iraq, Libya, Somalia, Sudan, Syria and Yemen. “The details and implementation of the executive order remain fluid, but we will continue to monitor actions at the federal level that may have an impact on our students, faculty and staff,” Bradshaw wrote. Though, university spokesperson Susan Evans said the university does not have any students enrolled from the affected nations. FGCU student Sharin Shafi said on behalf of Muslim Student Association that none of the club’s members or their immediate families are affected by the ban. Bradshaw continued his statement by highlighting the benefits of having a diverse student body. “We are strengthened by their contributions not only to our University but to the greater community at large, and appreciate the opportunities afforded us all to better connect as citizens of an ever increasing global society,” Bradshaw wrote. Rachel Iacovone (yah-cuh-voe-nee) is a fourth-year journalism student at Florida Gulf Coast University. She was born and raised in the Sunshine State, which may not be obvious considering her pale skin and less-obvious vitamin D deficiency. Also made less obvious by her skin tone — her Hispanic heritage. She can be found at the Eagle News copydesk or out shooting events around campus with one of her seven camera bodies. She is a self-proclaimed foodie and others-proclaimed hipster, proud Christian and bleeding-heart Liberal and an obvious fan of contradictions.